Notes: A sprawling, native cactus with flattened, leaf-like, succulent stems. The spines are modified leaves. Arising with the spines are fine, hair-like, barbed bristles, called glochids. 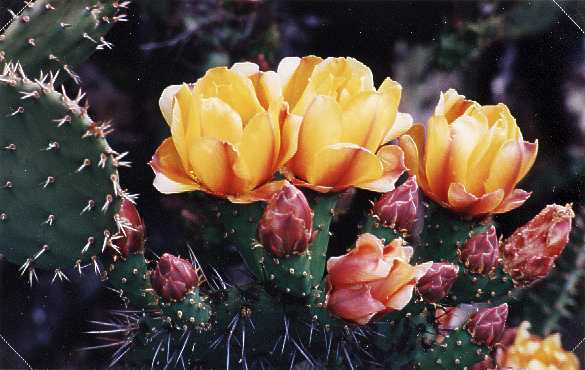 Glochids are found on all of the Opuntias (both prickly pears and chollas). Young growth (flower and stem buds), bear small, fleshy, deciduous, true leaves. The showy, yellow to reddish flowers have many tepals (undifferentiated sepals or petals), also many stamens and one pistil with many lobes. 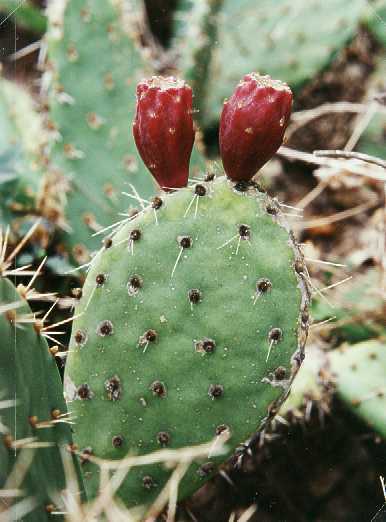 The fleshy fruit are red to purple and enclose many seeds.